If you need some inspiration, we are here to help guide you to the perfect lake activity for you. Whether you are travelling alone, as a family, or as a group we have something perfectly suited to all. 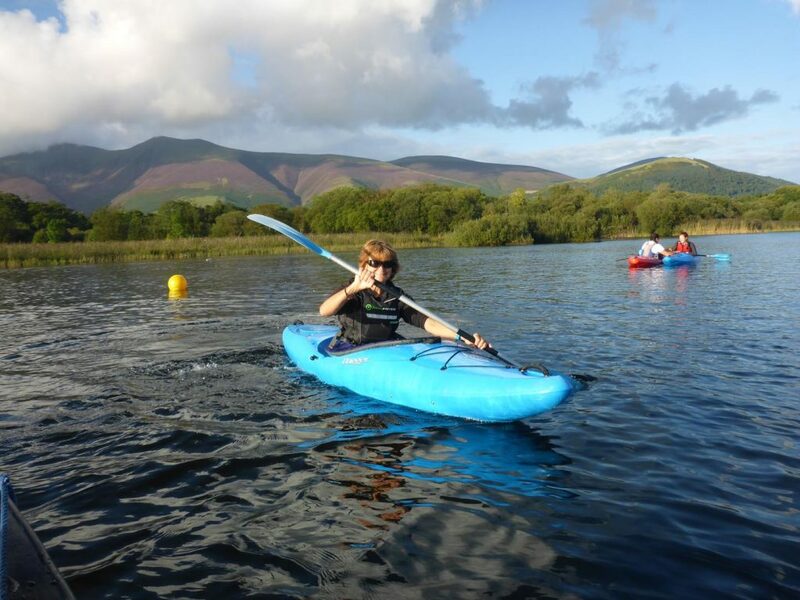 A great way to explore the lake and enjoy the wildlife and scenery of Derwent Water. 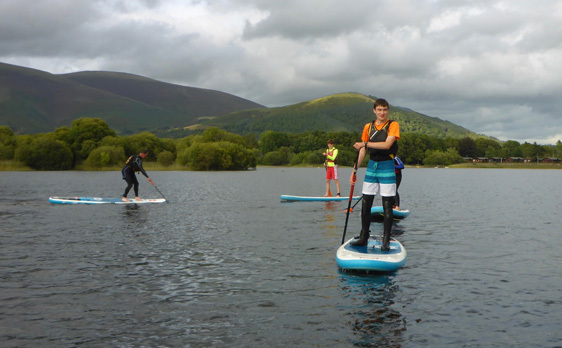 If you’ve never been Stand Up Paddle Boarding (SUPing) before, we recommend one of our taster sessions to give you the basic skills and confidence to go it alone. Work your full body and core strength while peacefully gliding the lake on one of our Red Paddle Co SUP boards. We offer SUP journeys to explore the lake with a group of SUPers. Family SUP outings can be arranged for two or more adults and all children (under 16) in one family. Please contact us to arrange this. The adults pay £55 each and the children £8 each for a two hour session. Our single and double kayaks offer the perfect way to explore the lake, no matter what your ability or experience. Why not take a picnic and explore one of the islands. Our fleet of kayaks include: Venture Flex, Dagger Katana or similar, Kiwi double Kayaks, RTM Mambo sit on Kayaks. Family Kayak outings can be arranged for two or more adults and all children (under 16 ) in one family. Please contact us to arrange this. The adults pay £55 each and the children £8 each for a two hour session. Our Canadian canoes offer an idyllic mode of lake transport, especially family groups. No matter what your ability or experience, we have something for you. Why not take a picnic and explore one of the islands. Our canoes are Mad River Explorer 16s. Our extensive fleet of modern dinghies means that whatever your experience there is something for you. Our fleet of boats include: Laser Picos, Fusions, Laser 1s, Laser 16s, Laser Bahias, Laser Funboats and Hawk 20 Keel Boats. Equipment: we have a wide range of wetsuits, spray tops and buoyancy aids. Please bring your own footwear such as wetsuit boots or old trainers. We also offer family day sailing outings for two adults and up to three children (under 16) in one boat. Please do contact us to make arrangements. 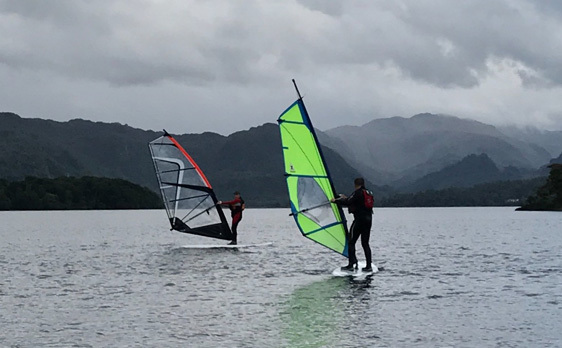 We have a range of windsurfing boards available to hire at Derwent Water Marina suitable for beginners and intermediates with sails from 1.5m to 6.5m. If you have never been windsurfing before then we would highly recommend one of our windsurfing tuition courses. We are a Royal Yachting Association Training Centre and offer a range of courses leading to the internationally recognised RYA certificates. Alternatively we can arrange tuition to suit you – it could be a half-day taster session for your first time out on a windsurf or a chance to update your skills. 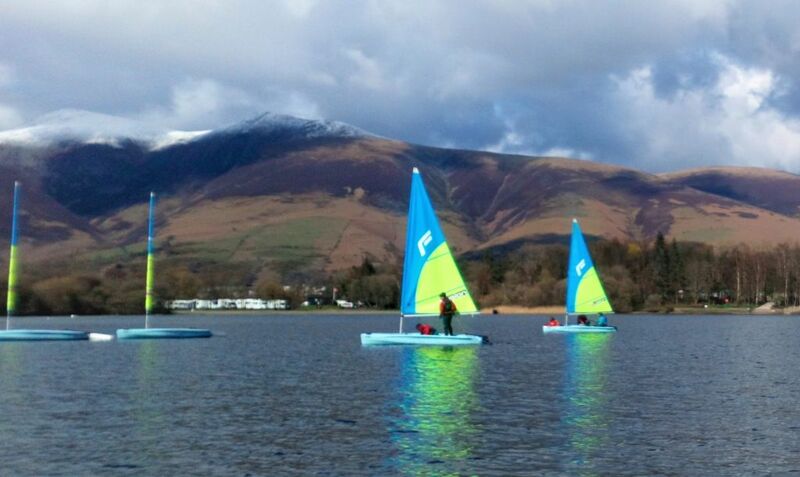 Come and enjoy the scenic views of the Lake District while doing an exciting activity. The descent of Stoneycroft Ghyll in the Newlands Valley. A series of slides, jumps and scrambles down this scenic mountain stream. Serious fun and you are guaranteed to get very wet! A fantastic activity for groups. Talk to us and we’ll be happy to discuss the options with you. Kayaks, canoes, stand up paddle boards, sailing boats and more. Details & prices for equipment hire at Derwent Water Marina. Upskill with our tuition courses. Intro taster sessions, lake journeys, refresher sessions, children’s activities and RYA courses. 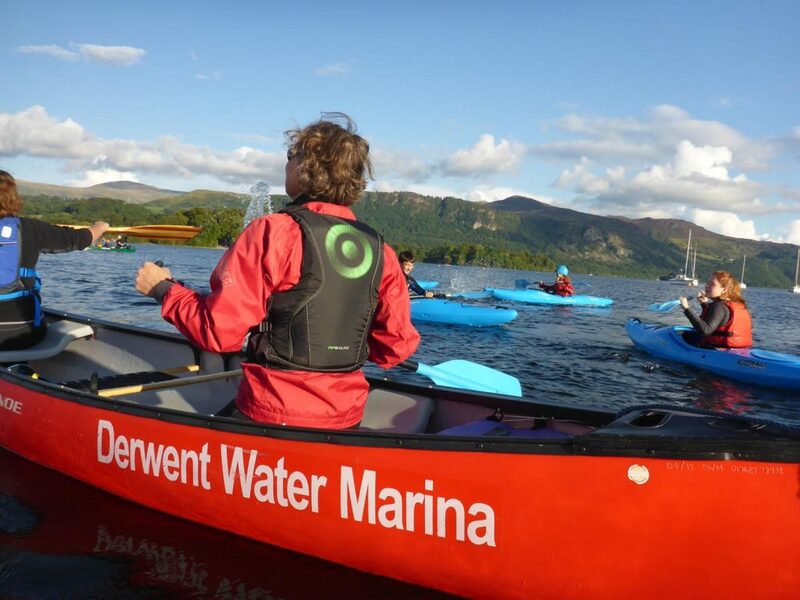 Families, groups of friends, parties, clubs and schools, check out all the group activities and adventures at Derwent Water Marina. Our Onboard Sailing Club is for young people aged 8-16. 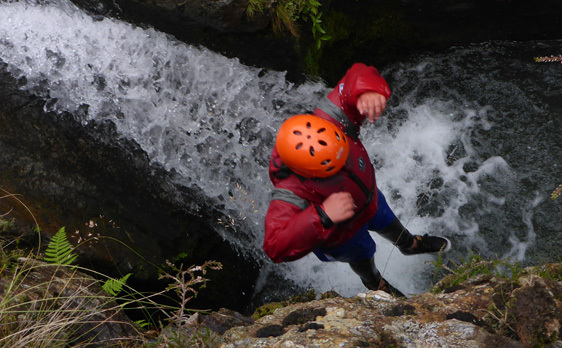 We have two groups ‘Swallows’ for age 12 – 16 who have completed their stage 2 and ‘Amazons’ 8 -11 or below a stage 2. ‘Swallows runs from 16th April to 15th October and ‘Amazons from the 21st May – 17th September – please call us for details of the start times. Non-members are welcome please call to check availability.